This document is intended mostly for developers who wish to develop a new GUI interface to Bacula. Until now, I have kept all the Catalog code in the Directory (with the exception of dbcheck and bscan). This is because at some point I would like to add user level security and access. If we have code spread everywhere such as in a GUI this will be more difficult. The other advantage is that any code you add to the Director is automatically available to both the tty console program and the WX program. The major disadvantage is it increases the size of the code - however, compared to Networker the Bacula Director is really tiny. The Bacula network protocol is packet based, and thus pieces of information sent can be ASCII or binary. The packet interface permits knowing where the end of a list is. The packet interface permits special ``signals'' to be passed rather than data. The Director has a number of commands that are non-interactive. They all begin with a period, and provide things such as the list of all Jobs, list of all Clients, list of all Pools, list of all Storage, ... Thus the GUI interface can get to virtually all information that the Director has in a deterministic way. See bacula-source/src/dird/ua_dotcmds.c for more details on this. One of the first things to overcome is to be able to establish a conversation with the Director. Although you can write all your own code, it is probably easier to use the Bacula subroutines. The following code is used by the Console program to begin a conversation. To help developers of restore GUI interfaces, we have added new dot commands that permit browsing the catalog in a very simple way. 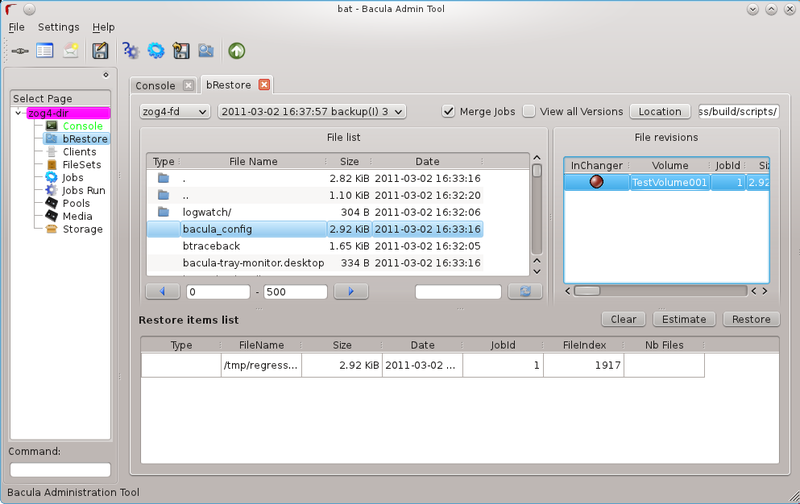 Bat has now a bRestore panel that uses Bvfs to display files and directories. The Bvfs module works correctly with BaseJobs, Copy and Migration jobs. This project was funded by Bacula Systems. At this time, Bvfs works faster on PostgreSQL than MySQL catalog. If you can contribute new faster SQL queries we will be happy, else don't complain about speed. Due to potential encoding problem, it's advised to allways use pathid in queries. The .bvfs_update command computes the directory cache for jobs specified in argument, or for all jobs if unspecified. You can run the cache update process in a RunScript after the catalog backup. Bvfs allows you to find all versions of a specific file for a given Client with the .bvfs_version command. To avoid problems with encoding, this function uses only PathId and FilenameId. The jobid argument is mandatory but unused. Bvfs allows you to list directories in a specific path. You need to pathid or path. Using path="" will list ``/'' on Unix and all drives on Windows. If FilenameId is 0, the record listed is a directory. 4       0       0       0       A A A A A A A A A A A A A A     . 5       0       0       0       A A A A A A A A A A A A A A     ..
3       0       0       0       A A A A A A A A A A A A A A     . 4       0       0       0       A A A A A A A A A A A A A A     ..
Bvfs allows you to list files in a specific path. Bvfs allows you to create a SQL table that contains files that you want to restore. This table can be provided to a restore command with the file option. To include a directory (with dirid), Bvfs needs to run a query to select all files. This query could be time consuming. hardlink list is always composed of a serie of two numbers (jobid, fileindex). This information can be found in the LinkFI field of the LStat packet. The path argument represents the name of the table that Bvfs will store results. The format of this table is b2[0-9]+. (Should start by b2 and followed by digits). To drop the table used by the restore command, you can use the .bvfs_cleanup command. To clear the BVFS cache, you can use the .bvfs_clear_cache command.